This refined band bracelet reproduces by means of stylistic synthesis the typical Sardinian dance taken from the local woven fabrics. 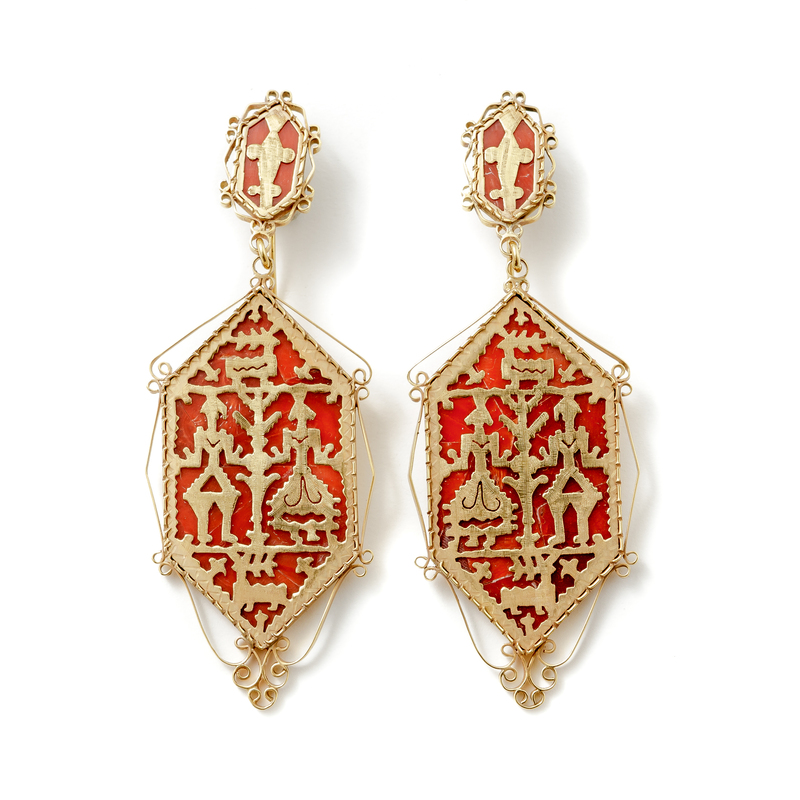 These prized earrings with Sardinian figures taken from the iconography of local woven fabrics are made of gold with a fret worked plate on coral mosaic, an exclusive and distinctive technique of this goldsmith’s workshop. 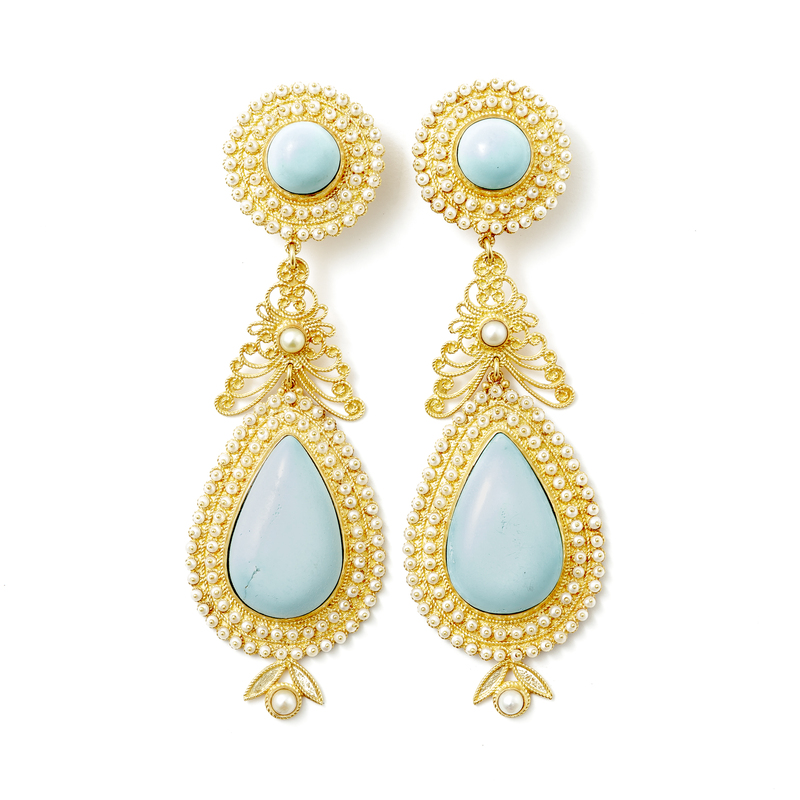 Inspired in design by the Sardinian goldsmith tradition, these fine filigree earrings are made with technical virtuosity, with impressive handcrafted turquoise bezels. 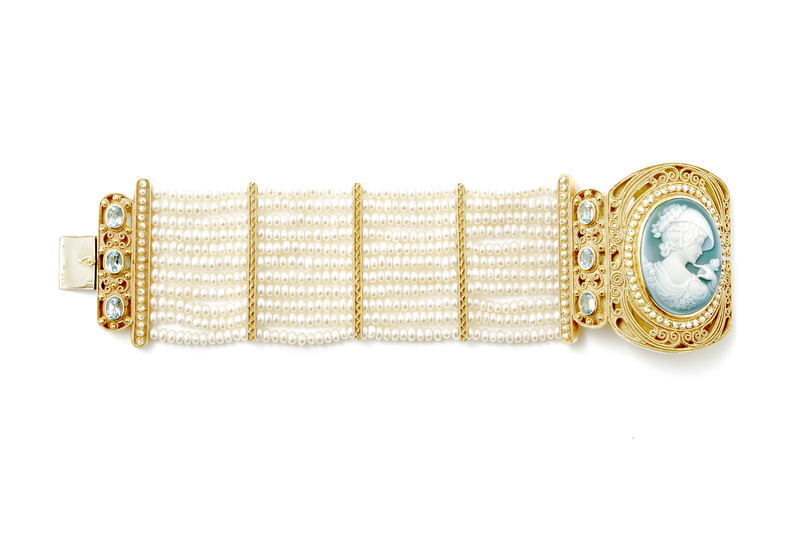 This striking bracelet with strings of pearls features a large cameo which is embedded in expertly crafted gold filigree and aquamarine. 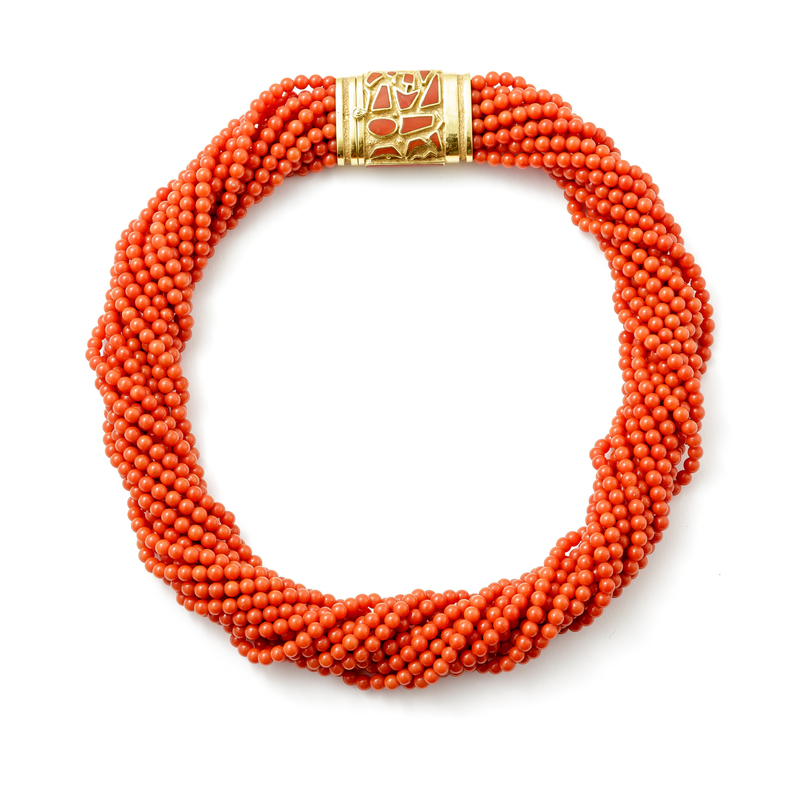 This striking necklace with torchon consisting of fourteen strings of coral beads features a refined gold clasp with inlaid coral. They are part of Antonio Marogna’s collection, consisting of the most representative works of this goldsmith’s remarkable production. Antonio Marogna’s distinctive goldsmith production represents and narrates a consequential part of the history of Sardinian craftsmanship relating to the local goldsmith craft in its evolution from tradition to contemporary style, especially as regards the crafting of coral. Following his natural talent for goldsmith techniques, and as a self-taught goldsmith, Antonio set up his own workshop in 1963 in Alghero, a renowned picturesque town in the north-western part of Sardinia, the heart of the coral riviera where the typical precious red coral comes from. This lively town distinguished itself in those years for the growing number of tourists and for the interest in the crafting of coral fostered by the opening of the School of Art with specialisation in the crafting of coral. Antonio’s jewellery was an instant success for the sensitive use of coral and the charismatic reinterpretation of traditional goldsmith techniques, which expressively revisited themes, symbols and the same techniques with an artistic trait typical of that period. With insight and competence, he started a wide-ranging production that he began to distribute to jewellers and specialised shops across the region, boosting commercial growth. In 1973 he inaugurated his first shop in Alghero, building on his skill and technical virtuosity to combine the complex crafting of filigree with the fine crafting of coral. Genuinely inspired and motivated, he involved in the activities of the workshop first his son Davide, who approached the sophisticated techniques at a very young age, and then Pier Michele; both are now devoted filigree goldsmiths and recognised experts in the crafting of coral. Sabrina and Marcella, who have always contributed to the activities of the workshop, are in charge of the marketing and management and of some of the crafting phases related to the assembling of jewels. Thanks to their invaluable work, Antonio carries on the production in the large workshop on the edge of the town of Alghero, where it is possible to admire both the rich and refined jewellery collection and the artisans engaged in the crafting of coral and in the performance of fine goldsmith techniques. The Marogna goldsmith production revolves around the crafting of coral combined with sophisticated and diversified goldsmith techniques. Many lines have characterised the workshop over time and still represent a rich and historical collection of designs that are true reference points for the creation of unique pieces which are entirely handmade. 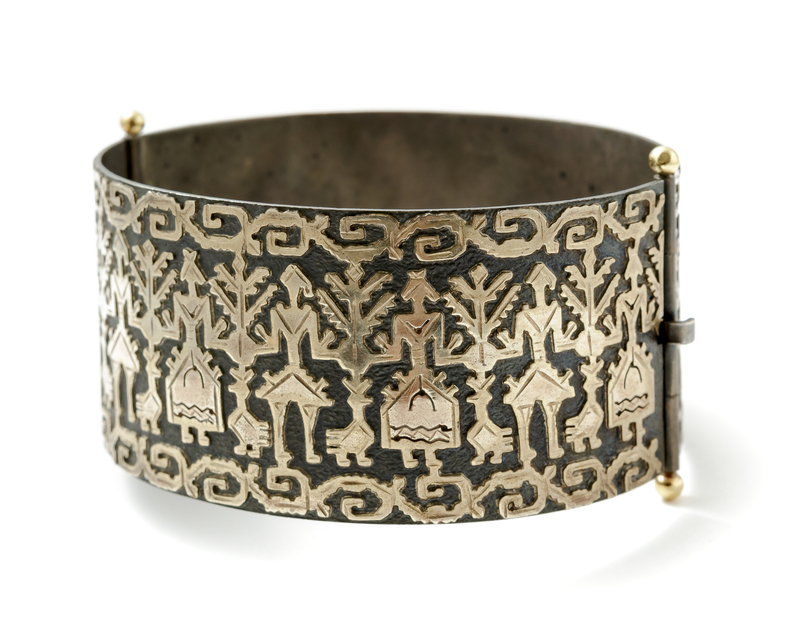 The line featuring fretwork on gold plate, with many variants according to the stylisation of distinctive traditional subjects used to create bracelets, necklaces and rings has a striking decorative impact. Remarkable goldsmith’s expertise is evident in the collection realised by performing the inlay of coral and semi-precious stones, where modern jewels feature sophisticated abstract motifs. Alongside these, there is a delicate gold filigree line that revives jewels typical of the local goldsmith tradition as well as original and refined reinterpretations of the same. Coral is handcrafted in all the various cutting, engraving and assembling phases. Various goldsmith techniques are performed with particular skill and technical virtuosity: openwork and granulated filigree, fretwork, inlay of coral and hard stones, combined with all the traditional goldsmith techniques. Particular care and attention are given to the stringing of coral necklaces and bracelets, for which pearls are meticulously selected in colour and size, with pinpoint precision.